experiment with new techniques and rediscover the simple joy of making things. describe, but I certainly know when it’s happening! are usually resolved and diffused into a quieter ‘hum’. move on to something new. down a thing, in search of energy elsewhere. combed assemblage pieces pinned to the wall and laid out on the studio floor. Making for the sake of making, which makes sense to me. 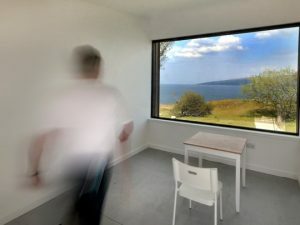 I arrived at The Admiral’s House in Lower Ollach, Isle of Skye on the 20th July for the first stint of my six week artist residency organised by Wasps Studios, Glasgow and Atlas Arts, Portree. My only plan before arriving here was to not really plan that much; just see what affect the house, studio and location might have on me. The residency has come at a good time for me as I was seeking a bit of breathing space, wanting to reflect on my practice and develop new directions and interests in my work. The shoreline is always in view here, only a short walk from the back of the house and overlooks the island of Raasay. It certainly offers you space to breathe! The three studios are dotted around the grounds of the central house, they each have their own individual character which hints at what type of work might be appropriate for them. 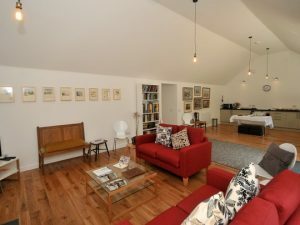 I’m in the Alan MacDonald studio for this stay, it’s the former garage space with fresh white walls, concrete floor, workbench and large wooden doors opening out onto the car park, looking up the tree lined track leading down to the house. I decide to get back to basics by using my sketchbook as a visual and written journal of my time here. I’ve all but abandoned drawing in favour of three dimensional works over the last few years and I’m keen to revisit it. I’m careful not to be too precious with my sketchbook, so it offers me a quick and convenient way of recording and soaking up the landscape. I go out early each morning, walking and then sketching from the hills and roads around Ollach with some encouraging results. Most days I return to the house for lunch and then make my way to the adjacent studio to collate my work and continue working, late into the evening. I decide to work up some of the field sketches into large charcoal drawings on sugar paper, enjoying physical, expressive mark-making, utilising the wall space available to me. I’ve been put in contact with a local boat builder and fellow wood enthusiast, Ewan Thomson. 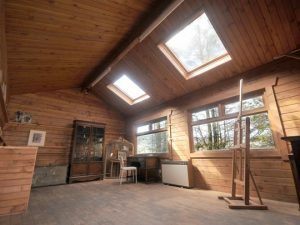 He invites me to view his workspace on the west side of Skye, around 12 miles west of Portree by road. I transcribe his address as ‘Fanks, second on left about half mile down the road’. After a few wrong turns I Fankfully arrive at the house and I’m shown around a collection of haphazard outbuildings: a small workshop and various storage spaces; mostly built using scavenged wood and material from the shoreline. After dinner we discuss some ideas and decide to meet the next day to go beachcombing. We start early and make our way west to a small village called Eabost. After a short walk down to the shore we are greeted by the rotting remains of a whale carcass washed up several months ago. Ewan makes claim to the bones and lays them aside to pick up later. We walk the shoreline for several miles; dragging logs, picking plastic and making small heaps on the grass and rocks safe above the tidemark; we place vertical sticks of driftwood to guide us back to the spots. This westerly facing shoreline provides a wealth of washed up materials – so much you must be highly selective, carefully considering what might be useful to you and bearing in mind what you can physically carry back! Often there are some tough decisions to be made as you discard one item in order to carry another. Being well-versed in beachcombing, Ewan has a good eye for spotting handy materials and combining them on the beach – fashioning a backpack from found rope woven through a washed up oyster bag. This allows him to carry longer lengths of driftwood on his back, freeing up his arms for other weathered treasures. I find myself drawn towards the surface quality and structural potential of coloured shards of plastic, weather-beaten fish boxes and other textured and unusual bits of board material. I return to the studio in the late afternoon and begin drilling, assembling and ‘stitching’ together some of the plastic using found rope. It’s almost impossible to get two bits that neatly fit together, but the irregular shaped plastic and the deliberately placed, almost machined look of the stitching, offer up a contrasting and satisfying aesthetic. They heighten and complement each other. Having gone to the effort to gather this ubiquitous material I found myself becoming precious with it, enjoying the odd shapes whilst carefully laying each one out on the floor in different arrangements. I’m mending or repairing something – piecing broken bits back together; everything is useful and this feels like a natural part of the process. 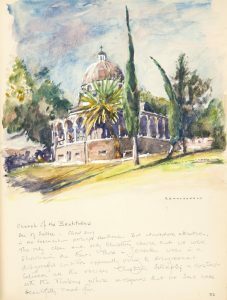 After a week at the Admiral’s house I’ve recorded my time by writing journal entries, taking photographs, field sketching, collecting found materials and dabbled in a bit of watercolour painting. I feel like I’m sharpening all my creative ‘tools’ and look forward allowing this to develop in the space between and during my next visit. 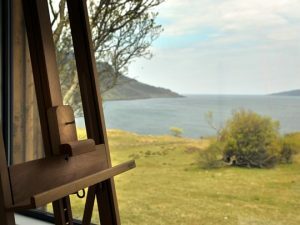 During summer 2017 I will be undertaking a six week artist residency at the Admirals House in Braes, Isle of Skye. 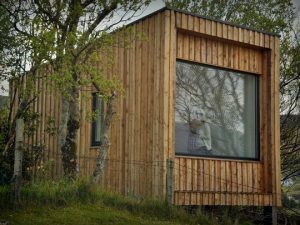 The project is funded by Creative Scotland and jointly organised by Wasps Artists Studios and Portree-based Atlas Arts. 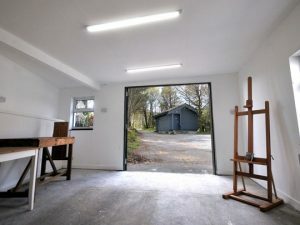 The facility is designed to allow artists the time and space to develop their own practice whilst engaging with the local community and getting the chance to meet other creative people that are using the facility. 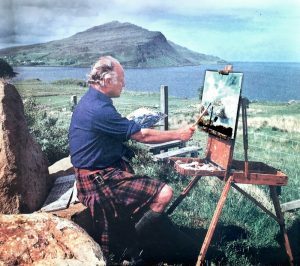 The cottage where Second World War veteran Vice Admiral Sir Roddy MacDonald retired to paint has been donated to Wasps after his death in 2001. 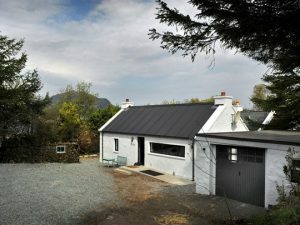 The newly refurbished facility has been restored with the addition of two extra studios and a workshop in the grounds. #MakeYourWay has recently installed the 'Rig and Furrow' bench at Chatelherault Country Park, designed by Martin Campbell of the Rag & Bone Workshop in collaboration with icecream architecture. The bench is inspired by patterns of ‘rig and furrow strips’ from Medieval field systems. Make Your Way is supported by Scottish Government Paths for All Transport Scotland Smarter Choices, Smarter Places grant, and Heritage Lottery Fund Scotland and South Lanarkshire Council LEADER supported Clyde and Avon Valley - CAVLP.